Curvature offers pre-tested Enterprise-class SAS Hard Drives, short delivery timescales and up to 70% off OEM List Pricing. Richmond & Amsterdam – March 16, 2017. Curvature, an innovative provider of IT infrastructure solutions and services, has announced that it will be entering the hard disk drive (HDD) market with a new line of SAS drives suited for server systems in professional environments and data centres. The models, ranging from 300GB to 4TB in 2.5” and 3.5” factors, are fully compatible with traditional OEM offerings, but offer savings up to 70% off their list price. 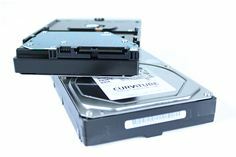 By pre-testing each drive before dispatch and offering shorter delivery cycles, Curvature is set to gain traction as an alternate supplier of choice for OEM branded (HP, Dell, Cisco and others) hard drives. Widely accepted as one of the weak points within any IT infrastructure, hard drives remain prone to failure given they are one of the only components within modern servers and storage arrays that have actual moving parts. Curvature’s range addresses this vulnerability by adhering to OEM Manufacturers’ specified requirements allowing a simple swap-out of the malfunctioning drive and a simple slot-in of the Curvature SAS drive. Each Curvature drive is rigorously tested before leaving the European head office, a process which is rarely followed by the OEM Manufacturers’ who simply expect a percentage of DOAs (Dead on Arrivals) to be returned. After install of the Curvature drive, users feel comfortable knowing that each drive is backed by Curvatures’ unique warranty and support offered through its worldwide infrastructure and maintenance programme, NetSure. The integration and testing by Curvature means that the drives are guaranteed to work as well as an OEM original and are compatible across multiple OEMs (HP, Dell and Cisco) using single firmware. Curvature offers enterprise-class 2TB, 3TB, and 4TB 3.5” and 300GB, 600GB, 900GB and 1.2TB 2.5” SAS hard drives that meet OEM specifications and requirements. Curvature is transforming how companies procure, maintain and upgrade equipment and support for multi-vendor network, server and storage environments. Founded in 1986, Curvature has become a trusted strategic partner for more than 10,000 organisations worldwide, including some of the largest telecommunications carriers, top financial services firms. Based in Santa Barbara, Calif., the company specialises in delivering 24×7 global technical support, advanced hardware replacement and complete lifecycle management of networking and data centre equipment from corporate locations in the America, Europe and Asia. The European headquarter is located in Amsterdam. For more information, visit https://www.curvature.com/. In February 2017, Curvature announced the exciting merger with SMS, Systems Maintenance Services to become the world’s premier IT network and data centre lifecycle services and solutions provider.